How Long Can Dogs Live With Cushing's Disease? 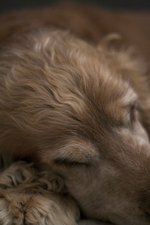 Cushing's Disease, also known as hyperadrenocorticism, is a common illness in senior dogs. It cannot be cured; however, the disease can be managed to give the dog a good quality of life for several years. Because the illness occurs in older pets, its symptoms are often mistaken for a normal part of aging. However, the condition can be treated--and many of the symptoms it causes eliminated--with various types of medications and therapies. The average age at which a dog is diagnosed with Cushing's Disease is 10 years. There is some evidence to suggest female pets are more prone to the disease than males, however, that is disputed among veterinarians. Spayed/neutered pets may be slightly more at risk. Some breeds seem to be predisposed, though this too is open for debate. Breeds that may have a predisposition for developing Cushing's Disease are the poodle, beagle, Boston terrier, boxer, dachshund, German shepherd, golden retriever, Labrador and various terriers. There are many causes of Cushing's Disease in dogs, though all relate to the body's overproduction of cortisol. Cortisol is produced and stored by the adrenal glands, which are on top of the kidneys. Most cases of Cushing's Disease in dogs are caused by a small benign tumor on the pituitary gland. This leads to the overproduction of specific hormones within the body and this leads to overproduction of cortisol. The adrenal glands work overtime to keep up with the excess cortisol. In some cases, Cushing's Disease is caused by the overuse of steroids for conditions such as allergies. A dog with Cushing's Disease will develop symptoms gradually. They will include weight gain, hair loss and urination in inappropriate places. Other symptoms include increased water consumption, increased urination, increased appetite, pot-belly, weight gain, loss of muscle mass, exercise intolerance, excess panting and baldness. The disease may also cause diabetes, pancreatitis and seizures. If Cushing's Disease is suspected, the veterinarian will likely begin by doing blood work. Elevated liver enzymes, cholesterol, blood glucose and white blood cells will indicate Cushing's Disease. Urinalysis, X-rays and ultrasound may also be used in reaching a diagnosis. The doctor may do a urine cortisol/creatinine ratio test and other diagnostic testing. Treatment depends upon the type of Cushing's Disease the dog has. Because the condition occurs in elderly pets, sometimes the decision is made to give no treatment except that which will make the pet more comfortable. In other cases, surgery, radiation or chemotherapy may be used. Medications such as lysodren, trilostane, ketaconazole, L-deprenyl, anipryl or vetoryl may be prescribed. If not treated, Cushing's Disease will progress, causing various other illnesses. Too much cortisol leads to a weakened immune system and leaves the body vulnerable to disease and infection. These will eventually prove fatal to the dog who is not treated or lead to the dog's euthanasia. With treatment, dogs generally recover within four to six months and may remain healthy for years. Because most dogs diagnosed with Cushing's Disease are elderly, they are able to live out their normal life span and usually die of something unrelated to the condition.